Well, we are here. Opening Day for Carols 2012. As I walked through parts of the Sanctuary this morning dealing (again) with lights that have come loose, I prayed for the participants that our hearts are prepared. If we do not share our beliefs, then what is the point of all this. I then prayed for the people who will be sitting in those seats and especially in the most remote parts of that room. The overflow goes behind the video boxes and they will watch on the monitor though they will hear everything live. Can we give from our hearts what is required for those folks with the “not so hot seats” to understand the Message? 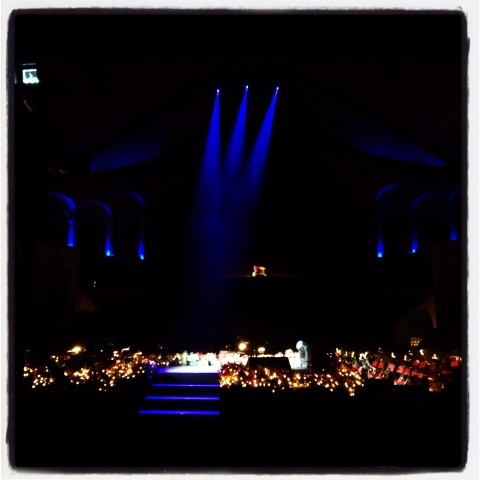 I think back every year to a Carols during the first few years we were in the new (current) Sanctuary. Wen the weekend was over and decision envelopes were being handled, one was found in the collection sack from the north balcony in the area that is now behind the video boxes. In those days you could see the platform from that point but, still, not prime seating. The young man had checked the box to indicate he had prayed to receive Christ as His Savior. On follow up, we learned he had died within days in a car wreck. The lesson to me then and now is that one life for Eternity is worth everything that we pour into Carols. God provided the Lamb for that young man. I am caught up in the story of Abraham and Issac. if your are listening carefully, this story is part of Dr. Page’s narration. “Abraham looked up and there in a thicket he saw a ram caught by its horns. He went over and took the ram and sacrificed it as a burnt offering instead of his son.”(Genesis 22:13 NIV). Abraham and Issac obeyed and God substituted that ram for Issac. God provided a substitute. Yet when it came to His Only Son, His Son was the substitute for us – me, you, all of us. No ram in the thicket. Just Jesus. Only Jesus. Last night, a former choir member who is working out of town this week shared by text from where she was having dinner in southern California. A musician was playing in the background and was intermingling Christmas songs among his other pieces. He played several secular pieces and then played “Silent Night” and the manager of the establishment stopped him after the first verse. How very sad. How grateful I am for the singer who at least tried to sing this. How I know that God provided the Lamb for the manager of that establishment just as He did for the young man whose life ended in tragedy. Through the media options we have these days, I can only pray that manager might hear His Story via the web or our broadcast or by other means. And I pray for those coming this weekend who need the Savior – who need to hear the story of His Amazing Love. God is with us. I believe.